Take a closer look at the Learning and Teaching in European Universities below. With 850 members across 47 countries, EUA is the largest and most comprehensive organisation representing universities in Europe. 17 million students are enrolled at EUA member universities. As the voice of Europe’s universities EUA supports and takes forward the interests of individual institutions and the higher education sector as a whole. 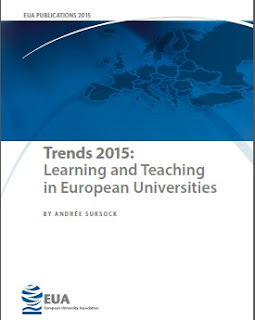 The Trends 2015 report presents the universities’ perceptions of the changes that have taken place in European Higher Education Area (EHEA) over the past five years, particularly in relation to learning and teaching. Based on survey responses of 451 higher education institutions from 46 countries (48 higher education systems), the report outlines the changing context in which higher education institutions operate.